“The Federation checks every lot that leaves Colombia. If the coffees were found to be anything other than washed processed, it would be rejected,” coffee importing business Cofinet Co-founder and Director Carlos Arcila says. Thanks to globalisation and influence of other countries producing amazing natural and honey processed coffees, the FNC revoked its restriction in 2015. Small farmers started experimenting with new processing methods, and the result, Carlos says, is a rejuvenation of the country’s reputation to produce high quality and exotic flavour profiles. When the restrictions lifted in 2015, Carlos and his brother Felipe, Cofinet Co-founder and Procurement Manager, started experimenting with natural and honey processed methods. That same year they started Cofinet in Australia. At first, Carlos says neighbouring farmers and clients were sceptical. “It is risky to produce naturals. Unlike washed processed, this method is not very forgiving. It’s very easy to get it wrong and produce something less desirable,” Carlos says. To achieve a clean and distinctive natural and honey process, cherries must be picked to a strict level of ripeness. A second hand sort is done to ensure only ripe cherries are used. The cherries are also placed in water for a further filter. Those that float to the top are less dense and removed. The ones that sink are used in the process. The ripe cherries are then placed in sealed grain pro bags overnight, for approximately 16 hours. Cofinet describes this process as “dry fermentation”. 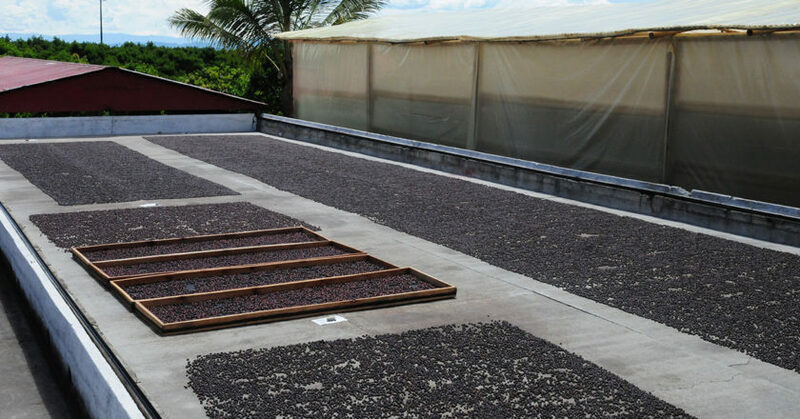 The cherries are then placed in parabolic dryers, raised beds, and concrete patios until the ideal 10.5 per cent moisture content is achieved. Due to high levels of relative humidity in Colombia, cherries are placed as a single layer to reduce the risk of growing mould. 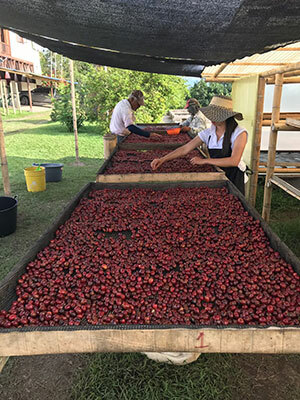 Carlos and Felipe recommend using natural processing at the beginning and end of harvest because of how long it takes to dry the cherries and how much drying space the cherries occupy. Having proper infrastructure is important. 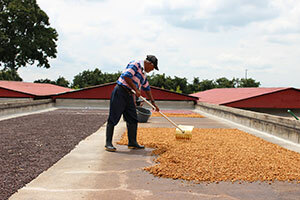 In Colombia, it takes twice the time and five times the space to dry naturals compared to washed coffees. Carlos says the failed attempt was a result of drying that was “too quick”, picking that “wasn’t strict enough”, and inadequate storage. Dried natural cherries must be stored in plastic bags otherwise coffee cascara will absorb moisure that later transfers to the bean. One of the main variables impacting the end result is heat. Carlos and Felipe now ensure the coffees don’t reach any more than 45°C by drying them slowly. They’ve installed a retractable roof to cover the beds for protection from the sun or rain. During the warmest hours of the day (11am to 2pm), the natural processed cherries are dried in shade. Cofinet has worked hard to balance its variables and is now producing up to two containers a year of natural and honey processed coffees with classic flavour notes of blueberries and peach. The honey process takes 1.5 times more energy than that of washed processed coffees. Just like naturals, the cherries are picked to perfection, hand sorted for a second time, and placed in grain pro bags overnight. The only difference is that the cherries are pulped before slow drying on concrete patios, parabolic dryers, and raised beds. Of the four types of honey coffees available – white, yellow, red, and black – Cofinet aims for black honey coffee, which is defined by the higher volume of mucilage left on the cherries after pulping and their exposure to the sun while drying. “We want to achieve the highest complexity in flavour so we try to leave the mucilage on and give the cherries lots of sun during the initial drying stage. The result is a sweeter and full-bodied cup with a heavier fruit that’s more on the side of berries and stone fruit,” Carlos says. From October, Cofinet will introduce three new varietals for the first time in natural and black honey processed pink Bourbon, Caturron, and Tabi. Carlos says already he’s getting requests from international clients in Asia and Europe, and Australian and international baristas are looking to use the coffees in regional coffee competitions. This article appears in the August edition of BeanScene. To read the story in FULL, subscribe now.